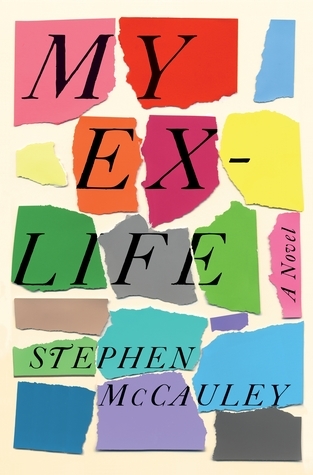 I couldn't wait to tell you about my latest author interview and book review for Shelf Awareness: I interviewed Stephen McCauley, author of the newly released novel, My Ex-Life, which is warm, insightful, and funny. Although this is Stephen's 7th novel (and three of them were made into movies), it was the first of his that I have read. I absolutely loved My Ex-Life from start to finish. It's the story of David, a gay man, and Julie, his ex-wife, who reunite 30 years after their marriage ended, at a time when they could both use the comfort of an old friend. Stephen has a real talent for insightful writing that also makes you laugh. You can read my full review of his wonderful novel at this link. After reading My Ex-Life, I was looking forward to interviewing Stephen and then meeting him in person last weekend at Booktopia, and I was not disappointed. He is just as warm and funny in person, with a self-deprecating sense of humor. You can read more about what went into writing this novel and Stephen's writing process in general in my interview with him. My mother also loved his novel and developed quite an author crush on him this weekend! We are both looking forward to reading some of his previous novels (I came home with one from Booktopia). I'm so glad to have discovered this talented writer! It's so great to meet an author you want to like and have them live up to that expectation. This book sounds fun. Yes! He was wonderful, both on the phone & in person. The novel IS fun, for sure, but it is also poignant - very well-balanced.